Ducktoes is in an old building built, I think, in 1913. A couple of days ago, a client came in for computer repair. He told me that his wife’s grandmother used to own the building. She was the landlady and lived upstairs in one of the apartments. There has always been a business (ours now) on the main floor and apartments above. Back in the 1920’s the business was a grocery store owned by a Chinese gentleman. According to my client, the landlady was getting older and couldn’t zip her dresses up in back anymore. She would come down to the grocery and ask the Chinese grocer to zip it up for her. Being the kind and personable gentleman he was, he obliged. She nicknamed him Jack the Zipper. The store has also been an ice cream and candy shop. Before we moved in, it was Dawson Technologies for many years. 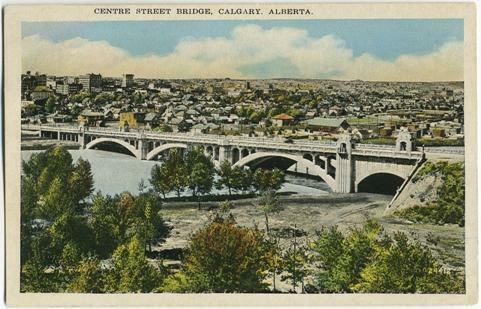 Our building and neighborhood were one of the first built outside downtown Calgary. They were in the outskirts then, suburbia. The bridge and the ferry before it allowed Centre St. to be a major thoroughfare. Here is more information about the bridge as it is today. Now I love it’s inner city location so close to the river and downtown, the old building, and our store. I have redecorated the store interior in yellow and blue, duck colours. Come and see us and our building. 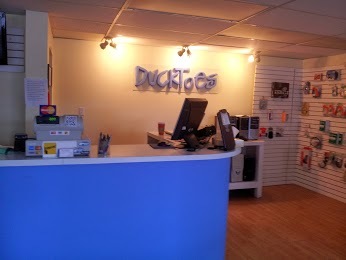 We are Ducktoes and we offer many Calgary Computer Services. We’ll even zip you up.